Caesar Augustus showed great respect for the Senate, but later emperors made no secret of their power. The Senate continued to exist after the reign of Augustus, but senators had little say over the affairs of the empire. Some of the emperors who followed Augustus ruled wisely. Others were foolish and cruel. 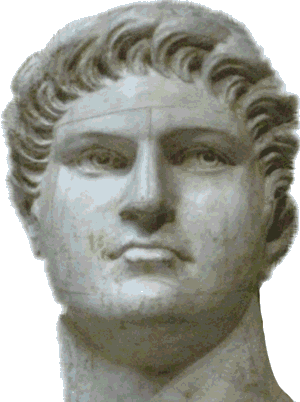 Nero was perhaps the most notorious emperor in Roman history. Nero became emperor at the age of seventeen after his mother conspired to kill his stepfather. Once Nero came to power, he ordered his mother’s execution. He also killed two wives and a stepbrother. Not only did Nero rule the empire ruthlessly by day, at night he prowled the streets of Rome assaulting women. Nero believed himself to be the most talented person in the Roman Empire. Never before had an emperor performed on a stage as an actor or singer. Many Roman nobles considered Nero’s performances to be outrageous and lacking talent, but no one would risk torture or death by criticizing the emperor. In AD67, Nero toured Greece. He participated in many games and contests, but no rival dared to beat the emperor. As Nero devoted himself to his outside pursuits, he lost ruling power. In AD68, Nero faced an attack from his soldiers. His guard claimed Nero cried out, “What an artist the world is losing," as he stabbed himself in the neck. It was under the emperor Trajan that, by AD117, the Roman Empire reached its greatest size. The empire extended from Britain and Spain, across France, southern Germany, and the Balkan Mountains. The empire also included North Africa and stretched as far east as the Caspian Sea. By that time, the empire completely surrounded the vast Mediterranean Sea, which later historians described as being a mere “Roman lake." In AD121, the emperor Hadrian built a wall across northern England to keep out invaders from Scotland. The Romans called the Scots “barbarians," possibly because their Celtic language reminded the Romans of the sounds made by sheep. In time, the Romans used this term for any civilization they considered uncultured. Eventually, another group of barbarian warriors—from Germany—would lead to the end of the Roman Empire. Nero Claudius Caesar Augustus Germanicus (37 – 68CE) reigned from 54CE until her death. Portions of Hadrian’s Wall are still standing today.